The Peruvian Sol is the currency of the Latin American country of Peru. It was introduced in 1991, originally named ‘Nuevo Sol’ (new sol) and renamed ‘Sol’ in 2015. ‘Sol’ means ‘Sun’ in Spanish. The Peruvian Nuevo Sol replaced the Peruvian Inti in 1991 at a rate of 1 Sol for 1,000,000 Intis. 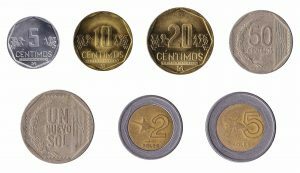 We exchange current Peruvian Soles banknotes, withdrawn older type Peruvian Soles banknotes (1991-2006), as well as Peruvian Soles and Céntimos coins. The Céntimo is the subunit of the Peruvian Sol, with 100 Céntimos in 1 sol.